Like many of us post-election, I argued with someone on Facebook about politics. Let’s be real: it wasn’t really about politics, only inspired by it. A long-ago friend from high school has a low tolerance for outrage on social media. She feels that outrage is more constructive when acted upon, not posted. She spends her time volunteering for the less fortunate and I couldn’t agree more with her stance. She and I share the exact same demographics right down to our zodiac signs. We are aligned politically. It seems obvious that we’d be on the same side because we want the same results. And yet, there’s conflict. I disagree that Facebook cannot provide an effective platform for expressing outrage and promoting social change. Social media played a large part in the Arab Spring—a revolution that began in 2010 and reshaped the power structure of an entire region of the world. Twitter and Facebook gave immediate access to information, which allowed people to mobilize. As a result, Egypt and Tunisia now have new governments. In the aftermath, Syria would be plunged into civil war. Indeed, social media is powerful and, like everything, can be used to good and bad ends. Having spent over a decade with a controlling partner, I know personally the danger silence can sow. Silence toward injustice is a form of permission, and I can no longer be silent when hate is projected onto a minority group. But four days after the recent presidential election, my high school friend posted a call for silence: “If you don’t like the violence you’re seeing then stop posting it on your newsfeed.” In response I wrote, “It isn’t the time to STOP talking. Even about the hard, painful things. It’s time to start doing whatever you can, in whichever way you can, to make sure accurate information proliferates. We can’t afford to stick our heads in the sand anymore and pretend everything will be okay.” But this exchange caused hate to bloom as her friends began to chime in. Quickly it evolved into a platform for personal insults toward me, and then people pouring salt into the wound by hitting the like button on them. That same week I also went to see the movie Arrival with a man I met a year ago and briefly dated. This man and I lose touch sometimes for months on end, but over the past year we have gotten to know each other well—well enough to pick up where we left off and meet casually for a Sunday night movie. We have a great deal in common and enjoy humorous banter. But our communication is 99% text messaging, and that’s a conservative estimate. We hadn’t seen each other in person in ten months. He travels more than half the year for work and neither of us really enjoys talking on the phone. But I can’t deny that not seeing his face subtracts a dimension from whatever connection we share. Staring into a glowing screen of small, yellow emojis versus someone’s real-life eyes will always feel different. 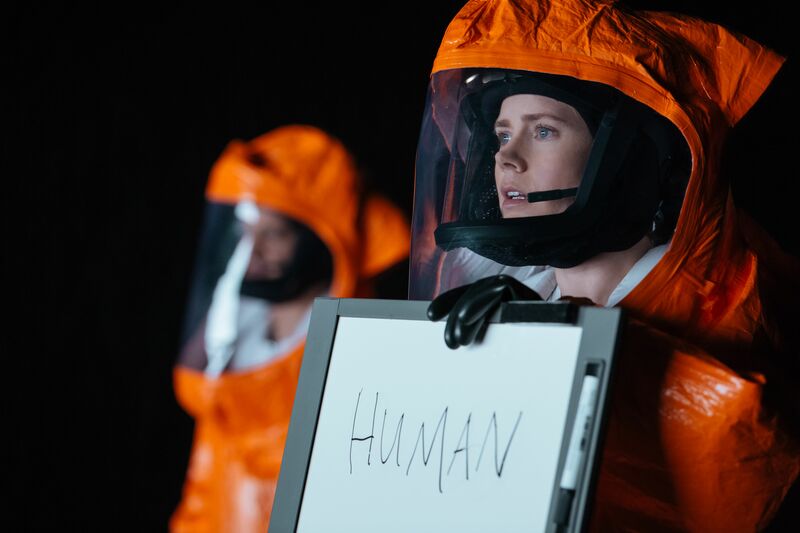 At the heart of the sci-fi drama Arrival, directed by Denis Villeneuve, is a story about language, communication, intention, and time. Aliens have parked twelve separate space ships around the globe. No one can determine what they want, and if they are friend or foe because, of course, they don’t speak our language. The central quest of the film becomes finding out why the aliens have come to earth. Dr. Louise Banks (Amy Adams) is an expert linguist. She is enlisted to attempt communication with the alien ship hovering over Montana. Ian Donnelly (Jeremy Renner) is a theoretical physicist and Dr. Banks’s scientific counterpart in attempting communication. During an awkward meet-cute on the helicopter ride to base camp, Donnelly begins quoting from Banks’s book. “Language is the cornerstone of civilization,” she writes, but Donnelly tells her she’s wrong—it’s not language, but science. And here lies the conflict between two people ostensibly working on the same goal. For the next eighteen months, Banks and Donnelly stand outside a glass divider day after day trying to create shared meaning with the aliens through analyzing their language and environment. Eventually, they create a whole alphabet system that uses digital devices to draw and translate meanings. This shared meaning of language allows for understanding. Without understanding, intentions are impossible to decipher and that is whole point of the interaction, to discover their purpose for coming. As it turns out, the heptapods (because they are very octopus-like with seven arms and float in a grey-white fog) do not think like humans. Therefore, they do not communicate in a way we understand as traditional language. Their communication comes forward as symbols that encompass entire ideas from many angles. Their thinking is non-linear, and their language comes across in circle-like shapes: no beginning, no end. Their concept of time is fluid and unrestricted to the present moment. Reality exists in all dimensions, not just the present one. Part of the complex, underlying theory of the film is that language dictates reality. The words we use to interpret the world, and the way we express them, are ultimately what determines our perceptions. This could not be more applicable to our time in history than this very moment. Although society is more connected than ever before through digital media, with many more ways of expressing ourselves and staying in touch, we have never been more disconnected from shared understanding. There has been a systemic breakdown of connection between human beings speaking the same language, let alone different ones. Even when we mean the same thing, we can’t find the common language to express it. Intentions have become impossible to decipher. This is the basis for the plot in Arrival. Unsurprisingly, communication between humans begins to break down—specifically between the twelve separate countries trying on their own to figure out the aliens’ intentions. In a race against the clock, Dr. Banks interprets one of the symbols to contain the word “weapon,” which is all the Chinese need to hear to draw their own. Though no one is listening, in her quiet, inquisitive, action-oriented way, Dr. Banks implores the others to wait. She needs more time to understand what the heptapods mean by “weapon” because it could also mean “tool.” Tensions mount, and war seems imminent worldwide. At the climax, the heptapods raise Dr. Banks up, alone, inside their spaceship filled with the grey-white fog. She is scared. She appears to be choking. After a moment, she acclimates and for the first time, she floats with them in the fog, not standing outside the glass wall divider. Only then is she able to understand their true intentions; she is finally immersed in their reality and experiences time in a non-linear way without a need for a digital device to translate. Ultimately, she stops the world from melting down over a lack of communication—by directly inhabiting the heptapods’ world and experiencing a type of empathy. Arrival makes many other poignant points about the subjective nature of time and reality. Much like other sci-fi films such as Gravity (2013) and Interstellar (2014), Arrival reminds us once again how small we truly are in the grand scheme of the universe, and that our connections to each other are the only thing which really matter in the end. For me, it illuminates the disconnection I have felt with many people in my life and how communication plays an enormous role in this. In a scene between Dr. Banks and Donnelly, who will eventually end up as a couple, Donnelly concedes to Banks’s view on language and its importance to civilization. He comments that it is no wonder he is still single when he understands so little about communication. Banks replies, “Trust me. You can understand communication and still end up single.” As a writer who has been single for the better part of two years, I wholly empathize. The man I saw the movie with will likely continue to be just my friend through text. There will always be something missing between us as long as our relationship is virtual. He will easily be able to tune me out and simply walk away without the immediate reality that I have a real voice and feelings beyond emojis. A crying emoji will never convey the reality of actual tears, and “LOL” will never allow you to hear someone’s laughter. Our communication is one-dimensional and our realities don’t match up because of it. We are disconnected. Connection fails when we fail to take the time to literally, and therefore metaphorically, see each other. I am also certain that if my high school acquaintance knew what I was really like, and why I fight so fiercely for my right to be heard, she would not dislike the way I choose to communicate. To her, my message is lost in translation. To me, her message is lost to silence. And yet, our messages are one and the same. There’s a breakdown between us because we communicate differently through an app on a digital device we carry in our pockets. But if she looked into my eyes, came into my world for just one day, she certainly wouldn’t allow her friends to lodge insults at me and then “like” them. Because what many read as weapon, I meant as tool. Image credits: feature image, image 1, image 2.